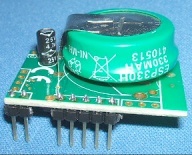 A replacement clock module for the A3000, A4000 & A30x0. More details here. As computers that appear to need a new clock may have other damage/faults that this module won't fix we offer a two week hire of this replacement clock module so that users can test their system. If hirers wish to keep the module we can then debt the standard price. Price: £5.00 no VAT to pay!